My NativeAdVantage: elloBEE - Connect & Seek Out Talented Professionals. 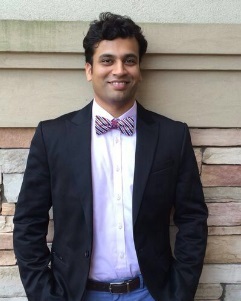 Tirthal Patel, Founder/CEO of elloBEE, with background in Engineering from Cornell University is passionate about using the latest technology to help skilled professionals around the world network efficiently by providing a platform to connect each other — whenever, wherever in real-time. Having traveled domestically and internationally either for pleasure or for business and while working as a Management Consultant, it was easy to bump into potential business contact(s), only to find out pockets empty of business cards. Facing this issue time and again and having to either exchange email or phone # without any other important background information linked to the individual, was a personal pain point, which led to a broader question: How to exchange personal information instantaneously to connect with someone anywhere, anytime, on-the-go and be able to seek out other skilled professionals on-demand when necessary? Too often, great deal of time is spent on finding the right skilled individual(s) by using myriad of other online tools. And elloBEE aims to address the issue of finding skilled professional(s), quickly and seamlessly on-demand on a single platform. Personally, I am best at conceptualizing a vision to address a problem and execute while being strategic. This skill set has benefited greatly in the development of elloBEE while making sure to provide value for the end user. While there are myriad of tools available, none provides the capability for skilled professionals to efficiently network and exchange information on-demand and in real-time. Whenever, Wherever. With the continued growth of Mobile phones, it is vital to exchange information & network on-demand with skilled professionals on a global level and not have to worry about managing contacts manually or spending significant amount of time searching for the right skilled individual(s). While various other widely known platforms provide great services, none provides a truly mobile, on-demand, efficient platform that leverages user’s closest network of contacts by focusing on their skills and capabilities. Our focus is on providing our users with 3 key values: 1) Exchange Information Seamlessly On-Demand. 2) Leverage Your Trusted Network of Contacts. 3) Seek Out & Connect with Skilled Professionals Globally. Personal: Travel and meet unique individuals. Business: Enable professionals to connect efficiently, seamlessly and on-demand through the use of technology. How technology and adoption of new ways of using technology works. To name a few: Grand Canyon, Yellowstone, NYC, Paris, San Diego. 1) elloBEE – I use it often when meeting other professionals in NYC and a bonus for saving some trees for not having to use business cards. 2) WhatsApp – Great for keeping in touch with Family & Friends. I enjoy traveling, trying unique food around NYC and being involved in exciting entrepreneurial ventures.